For your Perth home or business, you’re probably thinking about installing some sheds, perhaps for extra storage or space for a workshop. Whatever your reason may be, you may want to consider some additional features before beginning the construction of this project. There are a number of add-ons that you could include in your new shed and one of the most notable is the windows. However, this decision can be a bit tricky since the installation of windows has pros and cons. Windows make great additions to all kinds of workshops or storage sheds because they add extra light and airflow. The more windows you have in a shed, the more natural lighting will filter in. The same applies for airflow, as you can open more windows to increase the ventilation. For these reasons, windows are much more useful in workshops or other sheds where a person is actively moving inside. The natural lighting will save on energy costs and the extra air will keep the person cool and comfortable. Plus, windows can add style to what might be an otherwise boring structure. There are a few downsides to having windows in your shed. The more windows you have, the less weatherproof your shed will be since windows are weaker than the metal structuring and this can be a weak point in case of extreme weather. In addition, windows can tempt thieves because they can easily see what’s inside your shed, creating a security risk. Animal pests can infiltrate your shed, too. If you choose to have windows, you may want to think of ways to compensate for these weaknesses. You can tint your windows or make use of a covering to make the things inside your shed less exposed. To prevent pest infestation, you should just keep your shed closed as much as possible. There are a number of features we could add to a shed and windows are some of the most common. They provide extra lighting and airflow to the inside of a shed and style to the outside. However, they may create minor issues with security and vulnerability to harsh weather. Whatever you decide, we’ll help you build the best shed you can get. 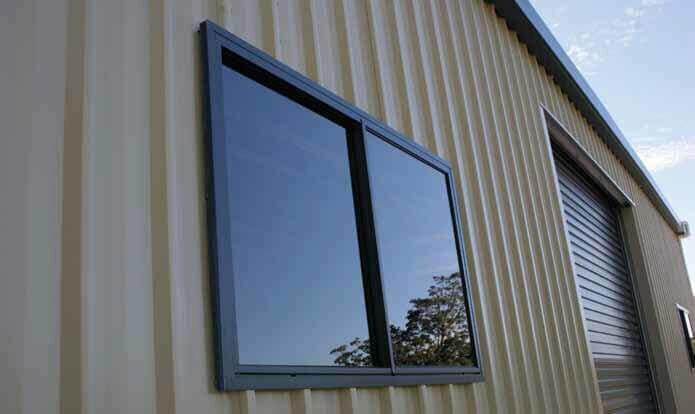 If you want to have windows, we have the standard sliding ones, which can surely fit your needs. For more information on how we can do this, call 1300 778 628.